Early in the morning of March 11, up in the mountains of an island off mainland Haiti, I journeyed along with a couple dentists and their staff on remote and dangerous roads that led to a village hidden from the world. A village that has never ever held the interest of a doctor or dentist. Yet they were waiting for us. These precious people of Makochon, bringing with them the awful caries and abscesses they had been living with for so long. 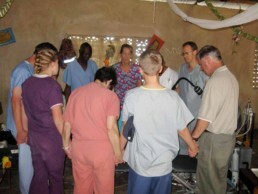 That day, before even the first patient was invited into that little church-turned-dental clinic, we gathered in a circle. With our nervous and sweating hands clasped, we dedicated this day, this week to the Lord, for had it not been God Who called us here in the first place? Why else would one leave the comforts of home with running, hot water; spider-less bedrooms and Applebee’s? Why risk bumpy-road-back-spasms? Why put up with daily PB&J sandwiches when back home we could run out for a five… five-dollar… five-dollar foot long? Why put up with rats and roaches and ankle sprains (we experienced them all) if it weren’t that something much bigger was at stake? Is pulling a few hundred teeth really worth all the time and expense and inconvenience? I suppose the answer depends on whom you ask. Some might argue that traveling a couple thousand miles to pull teeth isn’t a wise use of resources, that other investments would yield a higher return. But if you asked the 50-some-year-old man who, in howling pain, walked nine miles to get to us, the answer would probably be yes, it’s worth it. I’m not a dentist, so I could not be much help chair-side. This allowed me the perspective of standing back and taking things in. What a view! I witnessed a miracle: modern dentistry delivered high in the mountains–to a village that has neither electricity nor running water–was simply remarkable. Ask me if a mountain really can be moved and I would have to tell you yes. Yes! And I saw it with my own eyes. I suppose being on the receiving end of a miracle carries its own risk, too, and might not exactly be for the faint-of-heart. I could see it in those wide-eyed, next-in-line kids watching the dentists dive in after putrid molars, like pelicans diving for sea bass. Plenty frightened over their pending treatment, many of them needed a healthy dose of comforting to go along with their Novocaine. Starfysh’s new remote mobile dental unit was inaugurated with little fanfare last week, indiscernible by Google Earth satellites searching for landmarks—not “heavenmarks”. But I saw it, along with a few others. And I’m sure that God, from His much grander vantage point, was watching too. Heavenmarks. Not GPS so much as HPS. Coordinates where God comes down and does His thing.